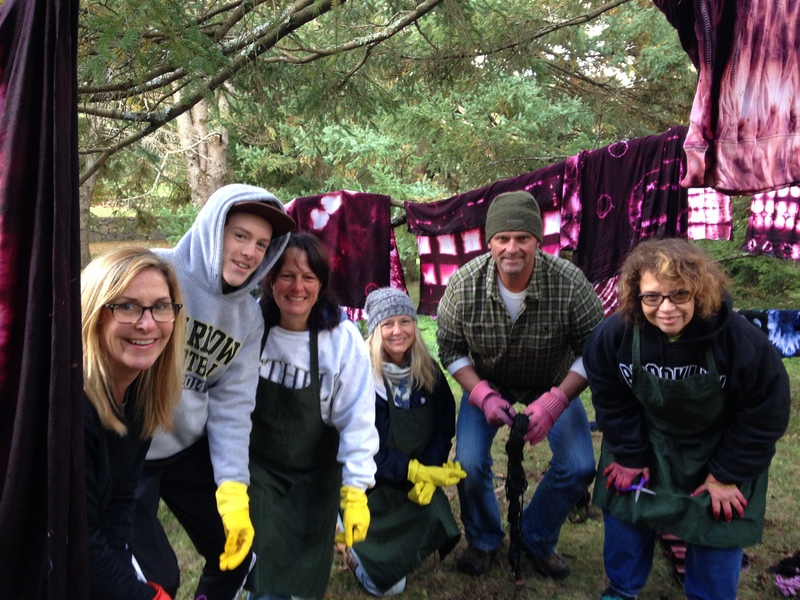 Last Sunday as the temperature took a nose dive into the upper twenties/low thirties I braved the elements and taught another Shibori Workshop out-of-doors at my dear friend, N’s home. 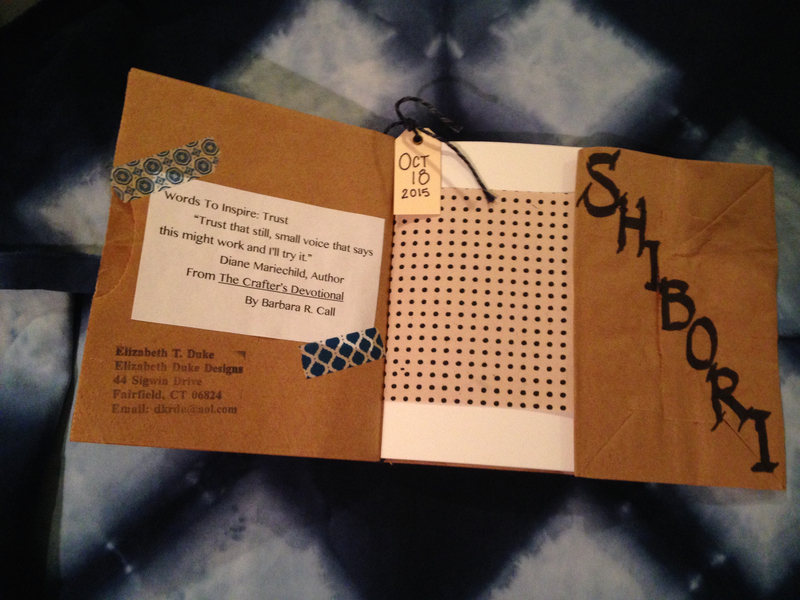 Pictured above is the Shibori Journal I made for each student for note taking during our workshop. As usual, my students brought their dyeing “A Game” and we continued our dyeing practice with a couple new resist techniques: using clamps, wooden blocks, wooden sticks alone and in combination with pleating, binding and stitching. We set 7 dye pots, an all time high! 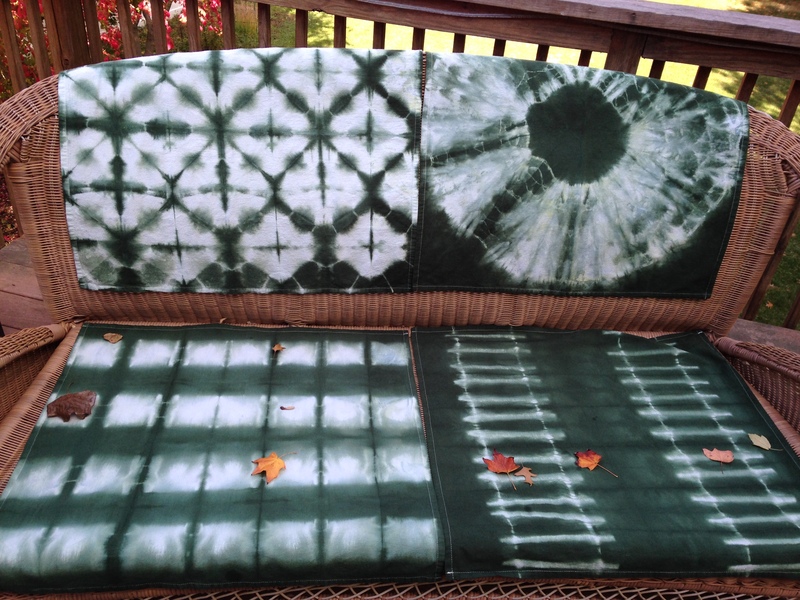 For colors: indigo (always a fave), dark green and we added a cranberry and inky blue green! The results were incredible! 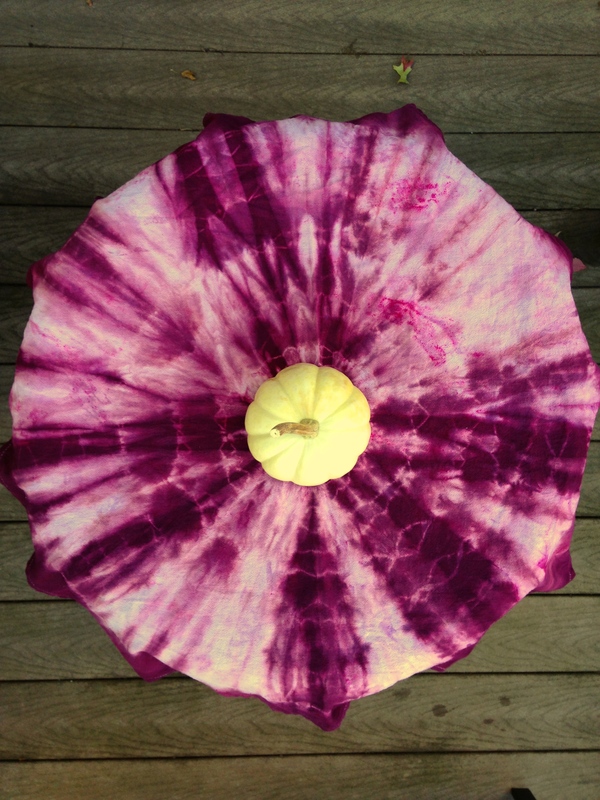 We decorated the Shibori Tree with our colorful work. With rosy cheeks everyone went home with a bounty of unique and gorgeous dyed pieces. And yes, we had two snow squalls! I think I had three layers of clothes on that day! 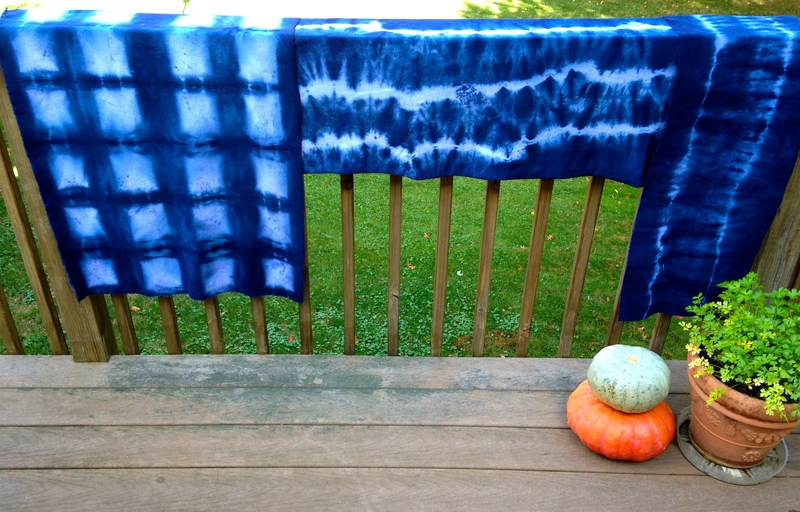 I personally experimented dyeing with white cotton jersey knit and cotton flannel and was thrilled with the results! My intent is to make scarves and pillowcases from my dyed fabrics as samples for my holiday sewing workshops starting after Thanksgiving. Once home, I washed and dried my fabrics and set them up to show you some of the beautiful details! 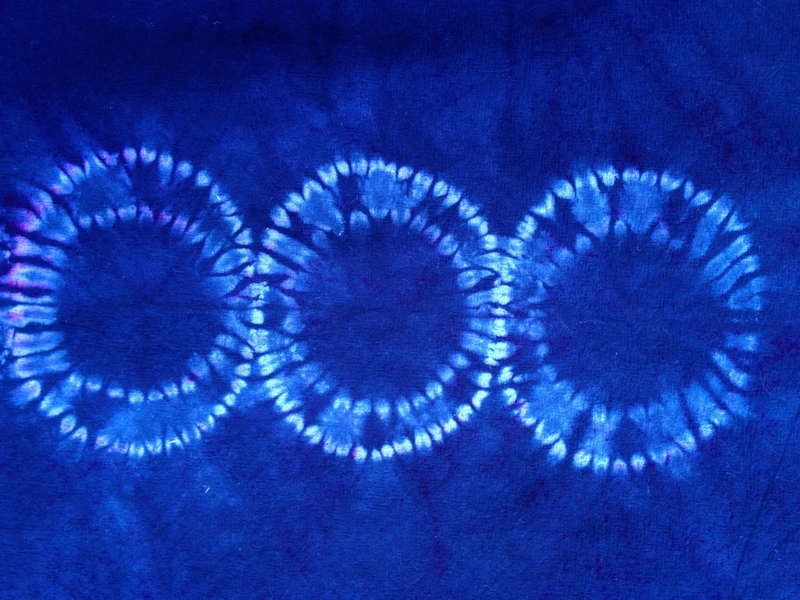 The design, below left, in indigo, was created by folding the fabric and stitching semi circles then drawing up the threads. This binding stitching technique is called “OriNuri Karamatsu. The above and below pieces were created by using wood blocks and folding or pleating with clamps “Itajime” or binding with twine. This lovely to the right in cranberry features the “Kumo” technique. Below, top left, in dark green is a lattice design with triangular folding using square wooden blocks and twine to bind. On the bottom left, the cloth was pleated, sandwiched between wooden blocks and then bound with twine. The bottom right was pleated and bound between wooden sticks and finally tied with twine. 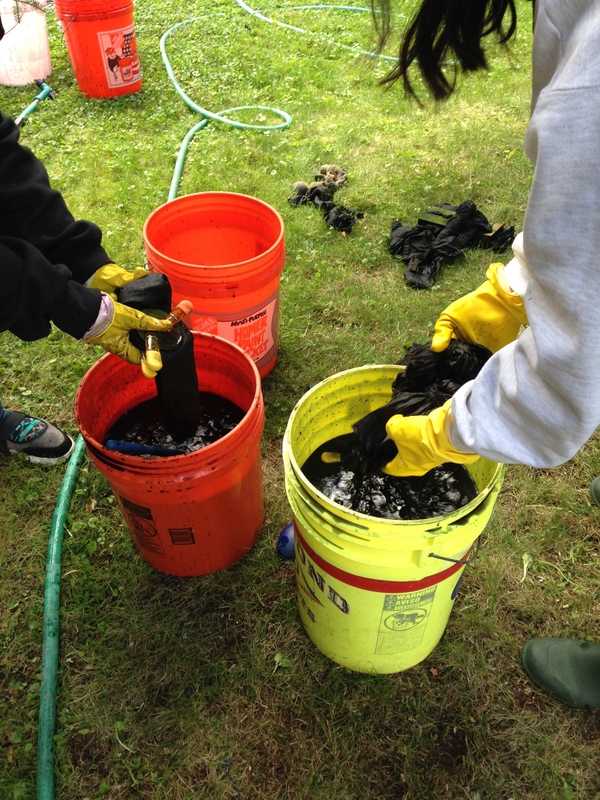 Dyeing days are always so gratifying! I feel so fortunate to be able to share my knowledge with like-minded creatives and to watch my students’ excitement and delight in both the learning process and the always surprising and breath taking final product! 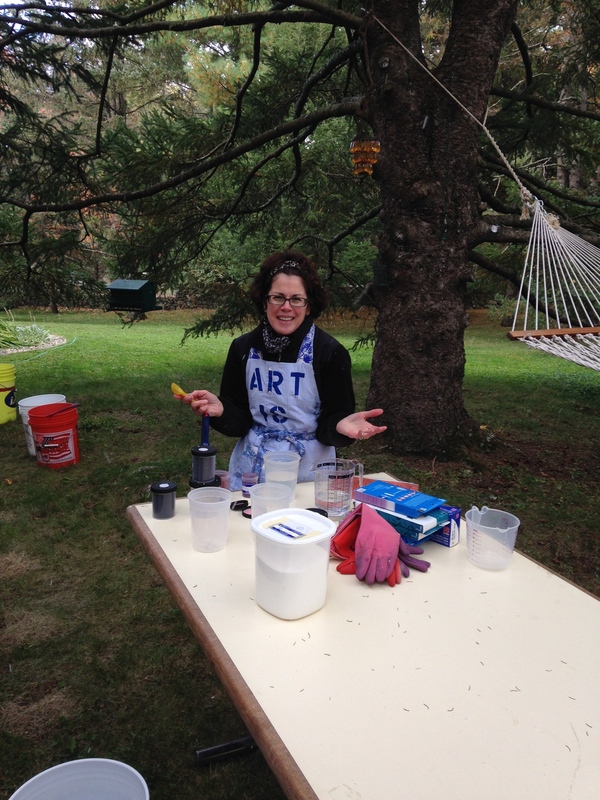 Art Is You Stamford 2015, Recap! 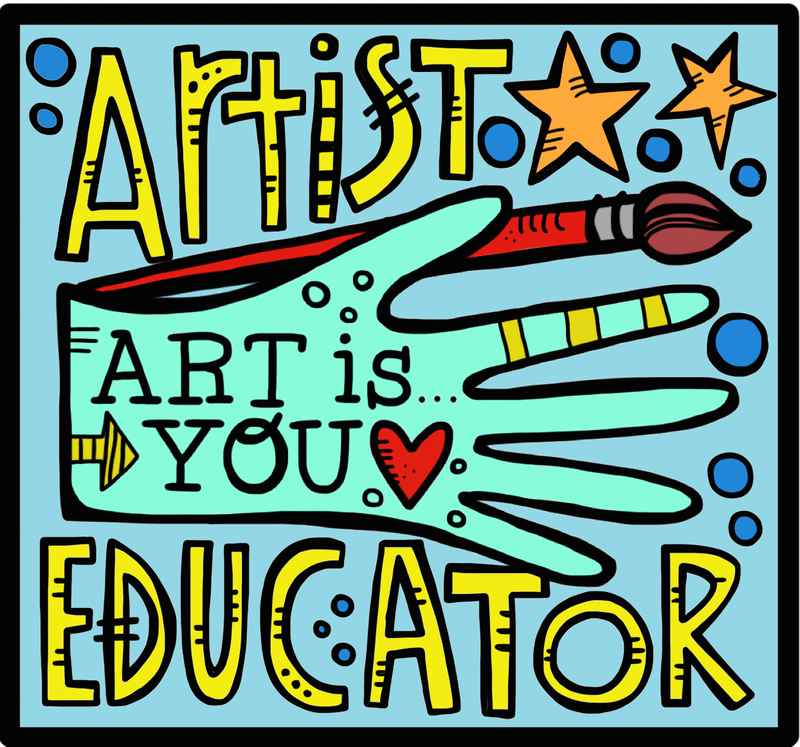 Just recently I had the honor and pleasure to attend and teach at the 10th Annual Art Is You Stamford 2015. 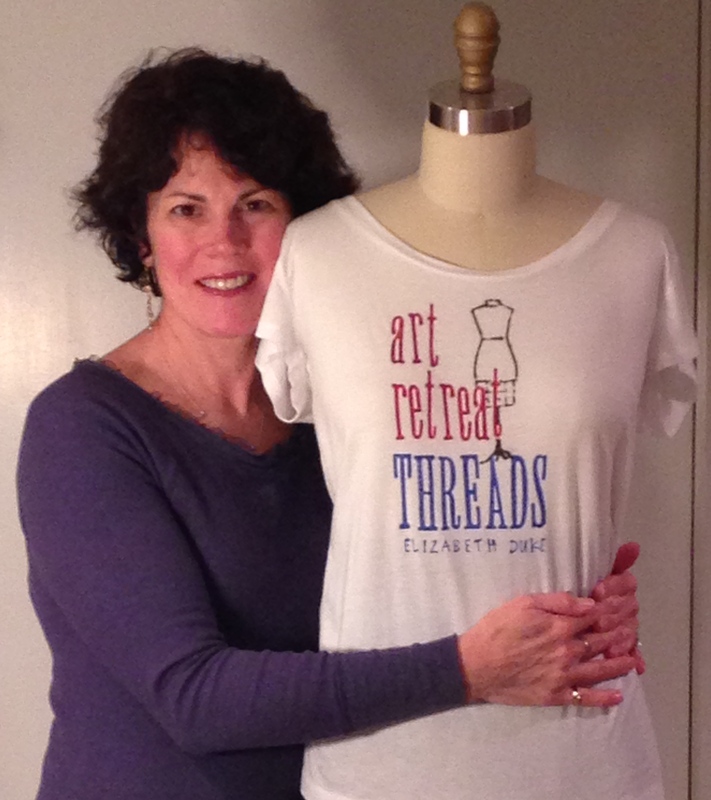 I had been preparing and promoting my workshop, “Art Retreat Threads” for almost a year leading up to the retreat. 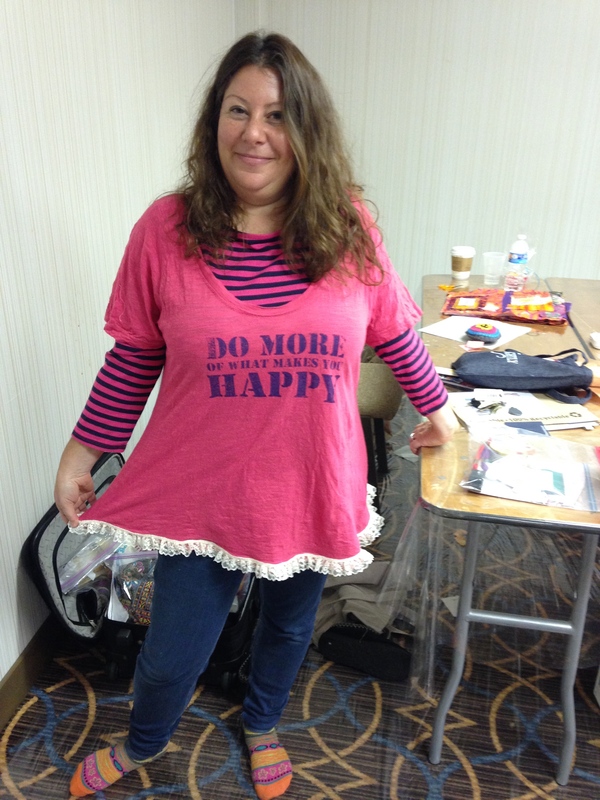 And am happy to report that the workshop lived up to my high hopes and then some! Every one of my students brought such enthusiasm and diverse skill set that added to the overall success of the class. The ladies all tried out the different techniques I offered to recycle and upcycle some of their clothing. Machine and hand appliqué, Reverse appliqué as patches, Fabric Painting with stencils and stamps, putting Inserts into garments with contrast fabrics, adding Ruffles, Hand and Machine embroidery and beading. Brenna who is still learning to machine sew, used two shirts that she had but wasn’t wearing and sewed them together as one and added a ruffle. Now she has a tunic to wear! 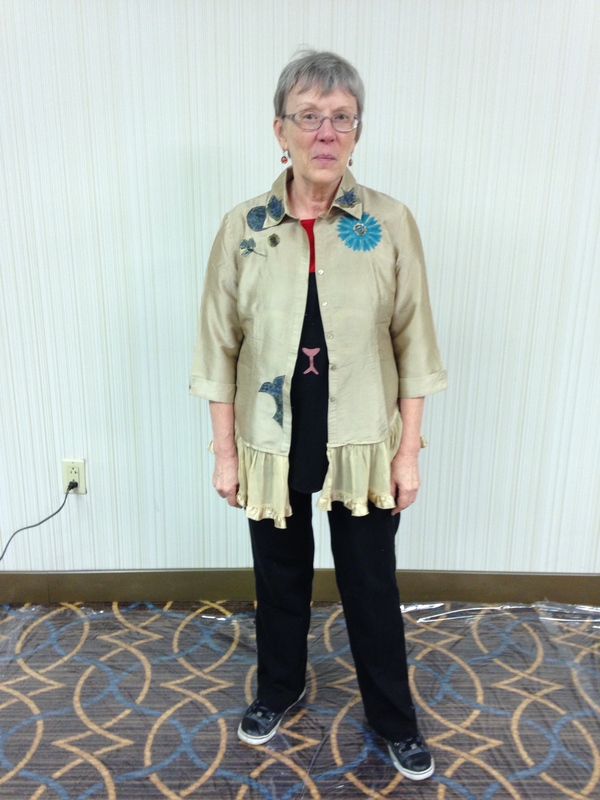 Judy (pictured below) found two silk shirts at goodwill and used the body from one and the ruffle from another and created a whole new look! 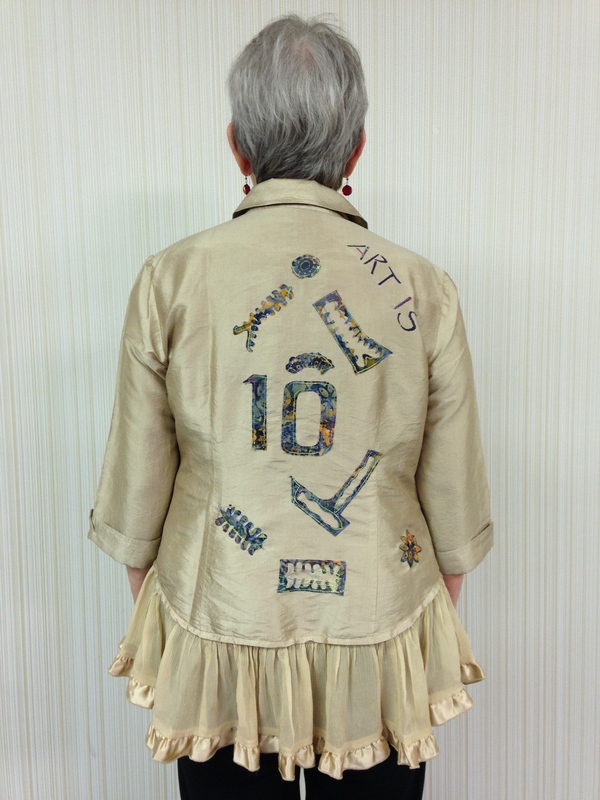 She took the upcycle further using machine appliqué, note the “10” (included in the class kit) to celebrate AIY’s anniversary and then added a sweet flower appliqué on the front! 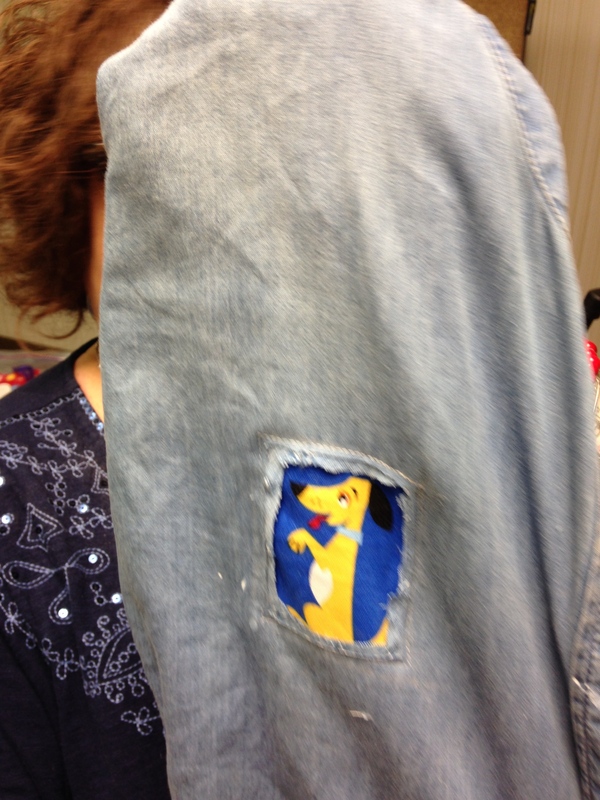 Susan went to work on a denim shirt where she used Reverse Appliqué to make a window with a fabric painted patch, fabric stamped where there were some tough to remove stains (you would think those crayon stains were part of the design…so clever of her! 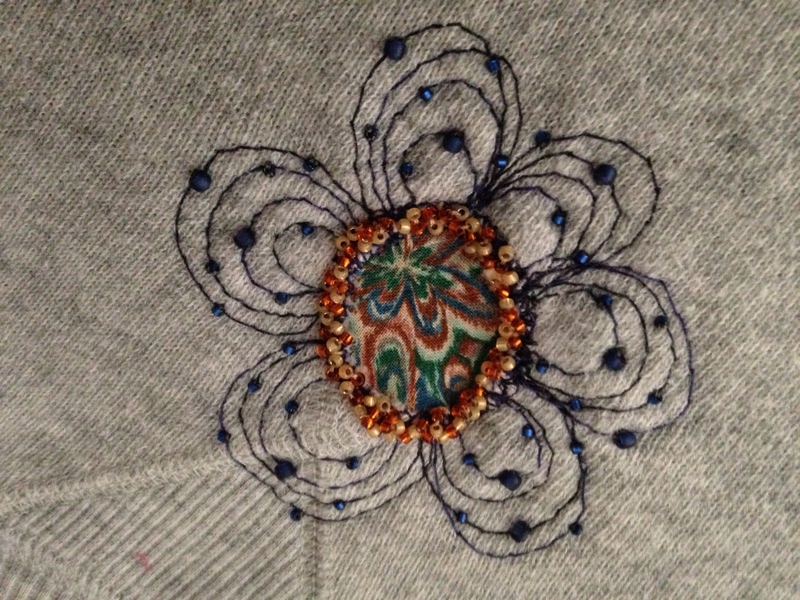 ), added a vent with some Shibori dyed fabric and then embroidered and beaded! She brought the WOW, for sure! Cheryl (hiding behind her shirt!) also up cycled a denim overshirt with a sweet RA patch window on the front and back and then added jumbo ric rac down the front button/buttonhole placket. CL focused on a denim skirt. She added a lined pocket and ruffle! I hope she sends a photo of her finished work! Our friend, Nancy, was only able to stay for the morning and was off and running on her garment…can’t wait to see some pics!! All students were given detailed directions of each technique in these handmade class journals, made from recycled grocery brown bags! Also included was a tote bad filled with fabric samples and supplies for each technique to continue sewing with at home. Thanks to Sallianne and Ellen for the this teaching opportunity! 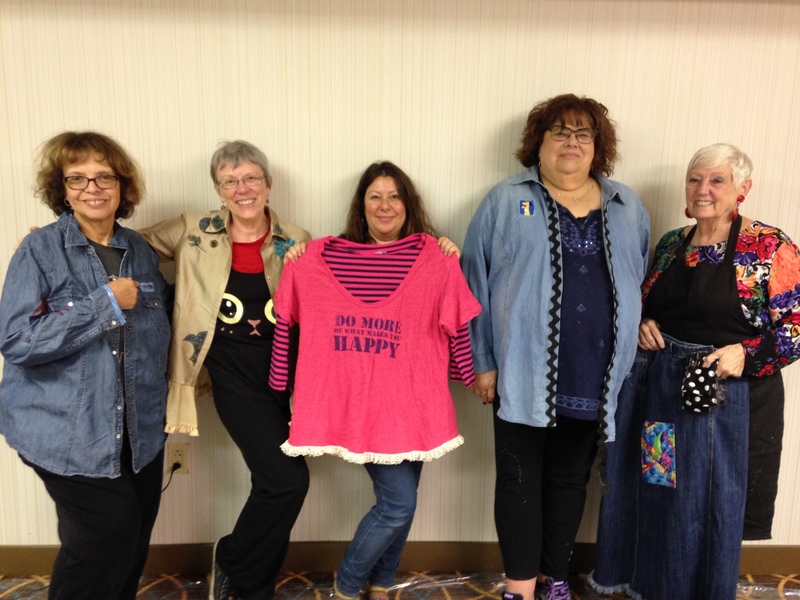 All my students were asking for a multiple day workshop experience with more garment redo’s and up cycling! You got it! I’m at work on some great new samples and will be in touch! 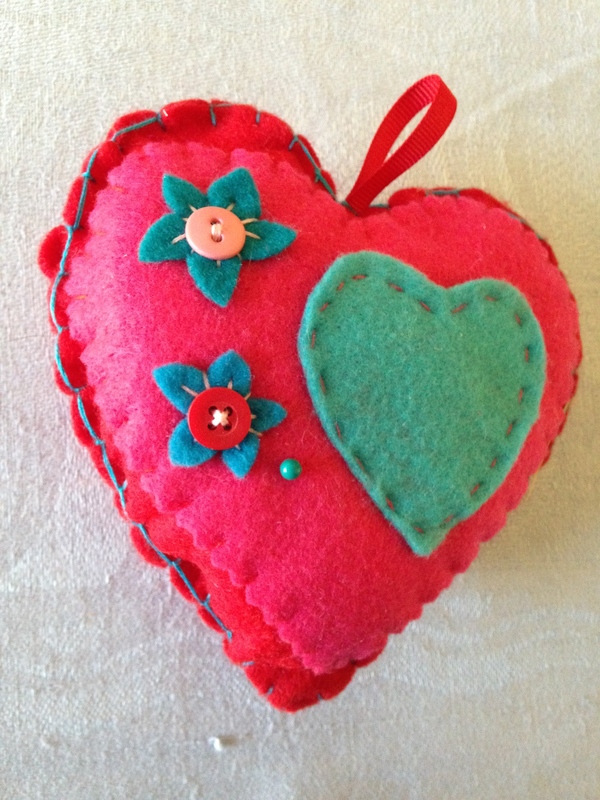 Brenna gifted me with this hand sewn and embroidered heart as a thank you for helping her with her machine sewing skills. I am grateful to her for her appreciation and to all my dear students for bringing such fun, talent and interest to our class!! Tomorrow I’m driving down to Art Is Stamford for the annual retreat. Here’s my trade reveal! I’ve been sewing scrap paper and fabric bit garlands forever. 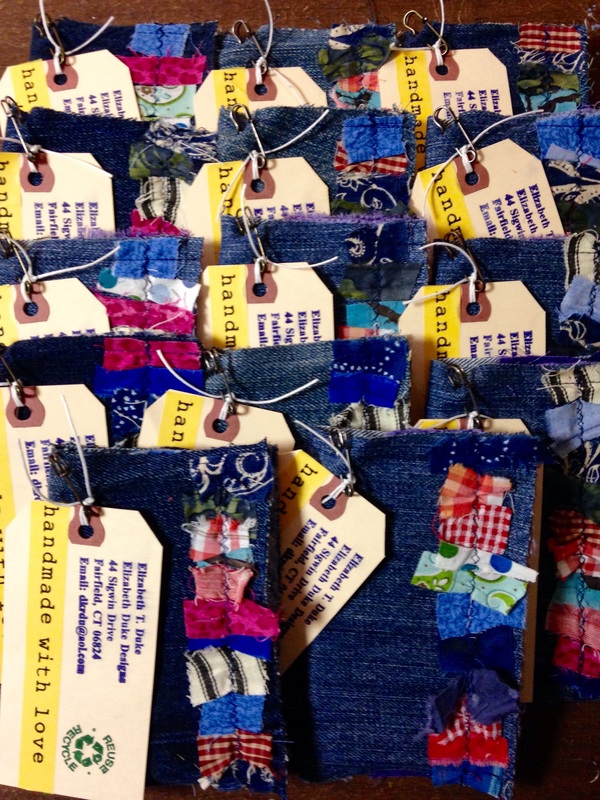 I chose to make yards and yards of scrap fabric garland to use as the focal embellishment on my recycled denim journals. 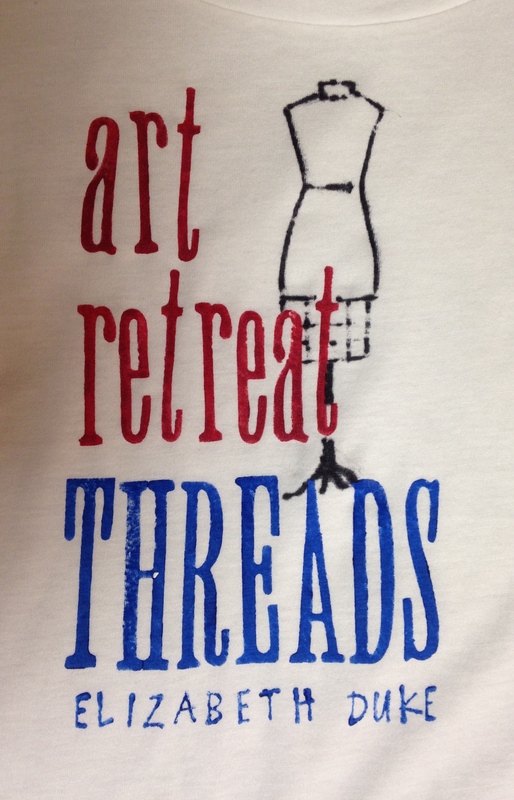 It’s almost here: Art Retreat Threads Workshop at Art Is You, Stamford 2015! I’ve been preparing for months for this exciting workshop and here it is less than a week away! We will be taking garments that already fit my students and recycling/upcycling them into fun and functional clothes to wear while creating at home or away at art retreats! 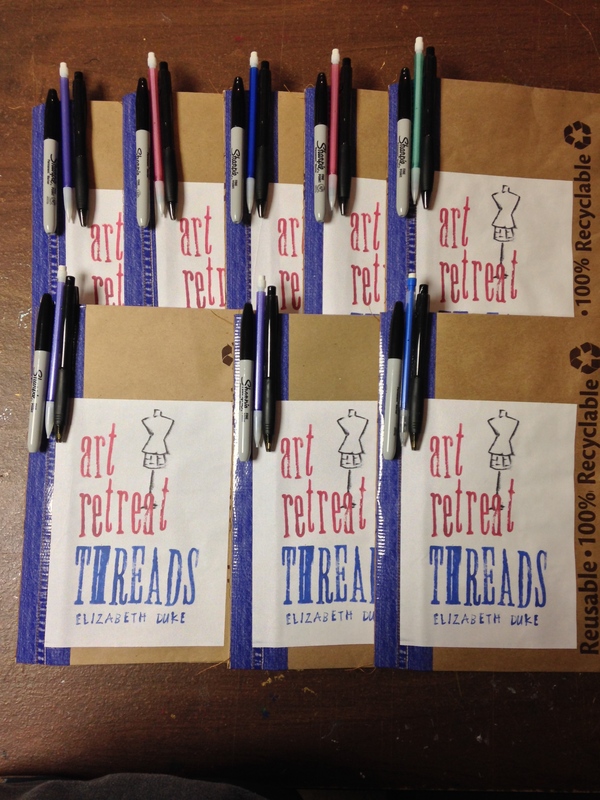 There will be hand and machine sewing, beading, embroidery and fabric painting! 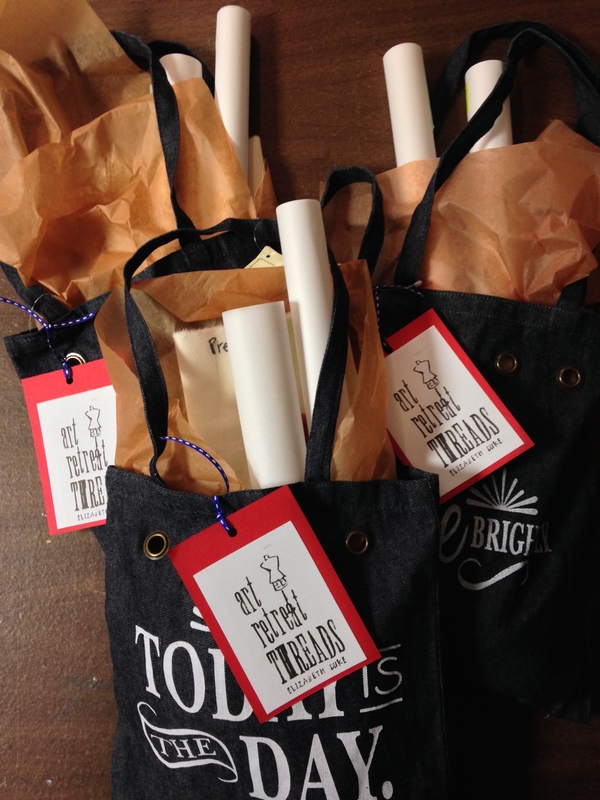 I’ve just finished packing up my class kits which include a handmade journal to take notes. Keeping with the recycling theme, I used a sturdy brown kraft grocery bag for the cover and then machine stitched the signature with that nice thick yellow denim thread! 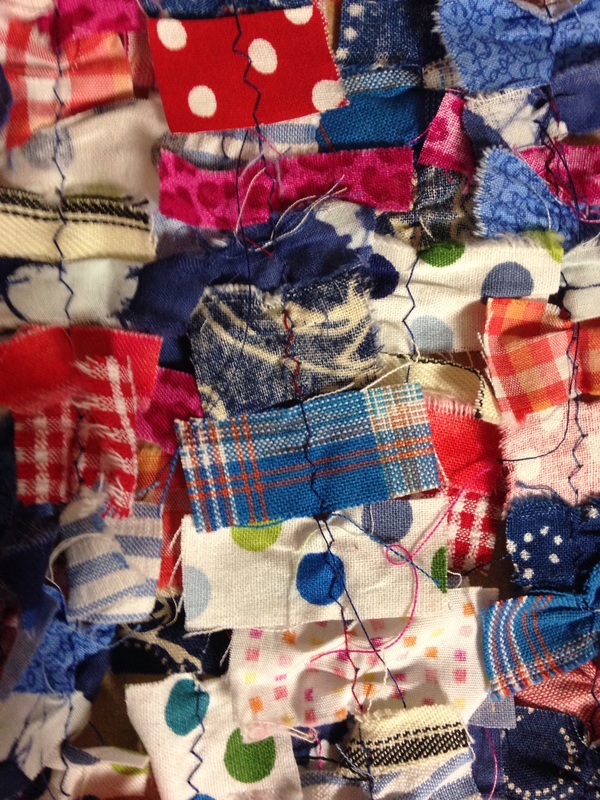 It’s going to be a great day of sewing and embellishing! 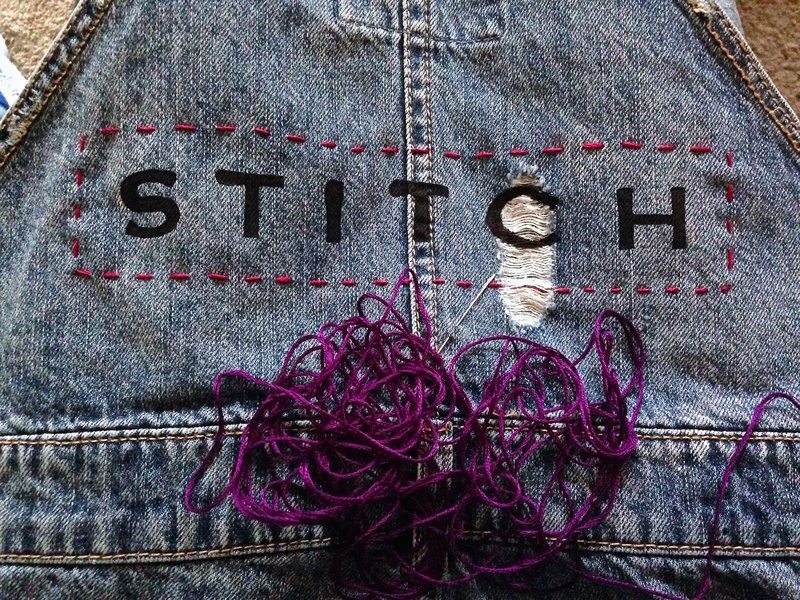 My goal is to have all my sewing sisters circled at the end of the day happily stitching a la old school, sewing bee style!! Can’t wait!